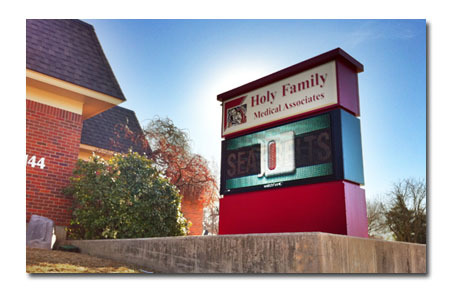 It all began when Bishop Thomas Olmsted offered his blessing and support to the formation of Holy Family Medical Associates (HFMA). Dr. Antonio Barba, Jr. and Dr. Ronald Ferris co-founded and established HFMA on August 15, 2000. Dr Barba had been in practice as an obstetrician/gynecologist for many years and was planning to move his practice from being by the Via Christi - St. Francis Campus to the Via Christi - St. Joseph Campus. Dr. Ferris had just finished his family medicine residency at the Via Christi Family Medicine Residency. The timing was perfect and by the grace of God, the two physicians came together at a new office by the Via Christi - St. Joseph Campus. The opening of the new office took place on August 15, 2000, which was also the feast of the Assumptioin of Mary. This feast celebrates the bodily taking up of the VIrgin Mary into Heaven at the end of her life. Dr. Barba retired at the end of 2006 after delivering thousands of babies during his career. Dr. Ferris continued with HFMA and on February 2, 2011, an open house was held to celebrate moving to a new office on Hillside. That day was also another feast to celebrate the Presentation of Jesus at the Temple.